Keeping an activity log of everything that happens on your WordPress websites and multisite networks is a vital security measure. As such, it’s important to understand how the new General Data Protection Regulation (GDPR) will impact the way you use your security and activity log. With the GDPR set to roll out soon, you’ll want to ensure that you are following it to the letter. Fortunately, WordPress plugins such as WP Security Audit Log can help you move towards compliance for your website, and for your security log itself. The GDPR stipulates that you must keep a log so you can remain aware of potential tampering on your site, and so you can make sure that only authorized people have access to sensitive data. To help you maintain compliance with this particular aspect of the GDPR, WP Security Audit Log can be an invaluable tool. In this article, we’ll explore what the GDPR means for your site. Plus, we’ll introduce some strategies you can implement to make sure your WordPress security and activity log, and your website as a whole, adheres to its requirements. Let’s dive in! The General Data Protection Regulation (GDPR) is a European Union initiative. It’s designed to give users greater control over the way their personal data is collected and used online. The stipulations of the GDPR are applicable to all website owners who have visitors from within the EU. Right to Access: This means you will need to be as transparent as possible about how you’re using personal data. Users will also have the right to access and port their personal data. Right to Be Forgotten: If a user wishes for their data to be completely erased from your site, you’ll need to comply. Right to Be Notified of Data Breaches: Should a breach be detected on your site that has the potential to compromise the ‘rights and freedoms’ of any users, the relevant parties will need to be notified. Failing to comply with the GDPR could mean incurring hefty penalties. Before you hit the panic button, however, rest assured that help is at hand. As the name suggests, a security audit log (or WordPress activity log) is a record of all the activities that have occurred on your site within a particular time frame. WP Security Audit Log makes creating and managing this record simple, giving authorized administrators a clear overview of when and where all actions have occurred. Since the GDPR states that your business must inform authorities and all affected users of any data breach within 72 hours of its occurrence, a log is a powerful forensic tool. It will enable you to better understand what has occurred, which security hole was exploited (so you can close it), and what information (personal data, customer data, or otherwise) was accessed. The following is a rundown of four crucial ways an audit log can help your site remain GDPR compliant. 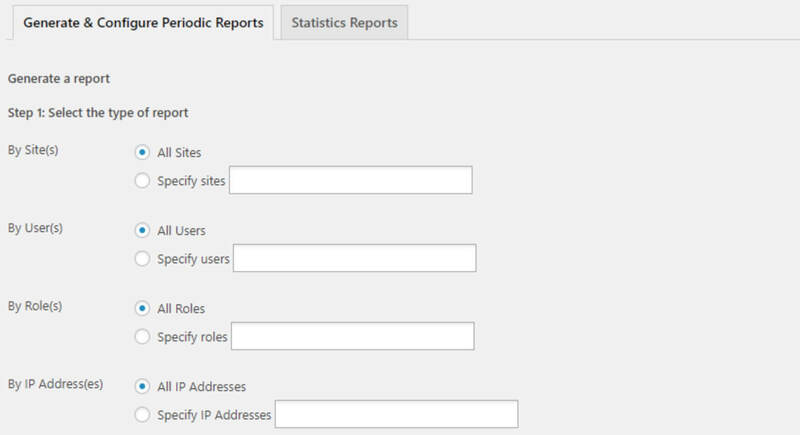 WP Security Audit Log enables you to effortlessly monitor user activity, and block suspicious activity. Using a security log, you can monitor the specific actions being taken on your site. This can include actions by staff, customers, and all other visitors. The GDPR stipulates that any breach needs to be acted on immediately. WP Security Audit Log offers a number of advanced features that make the process of monitoring (and breach detection) simple. You can immediately see who is logged in, as well as who has logged in previously and when. Plus, you can view the changes users have made on your site, and even immediately terminate login sessions you deem suspicious. 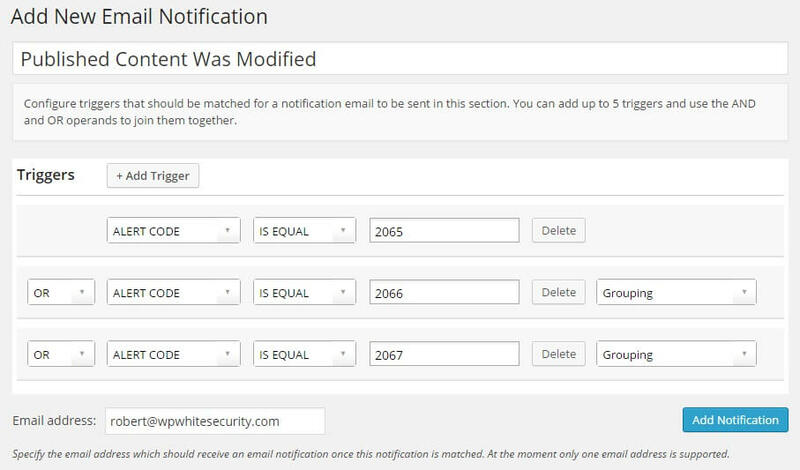 With WP Security Audit Log, you can configure exactly what triggers an automated email notification. Since it is usually impractical to devote hours to poring over a monitoring screen, an effective security log should send automatic emails whenever an important change on your site occurs. Notification emails can help you identify and resolve potential breach situations rapidly, ensuring that user data is protected in accordance with GDPR stipulations. With WP Security Audit Log, you can configure triggers so that you receive an automatic email notification when specific events or changes happen on your website. You are also given the option to edit the email template and content to match your specific business requirements. A quality security log will let you generate an array of reports filtered by specific users, roles, IP addresses, and more. GDPR compliance requires knowing which users have accessed what personal or customer data (and when). This means that your security log should generate automated reports, to give you a rundown of all actions that have taken place on your site. That way, you can rapidly identify discrepancies and potential breaches. Using WP Security Audit Log, you can have automated reports emailed directly to you on a monthly, weekly, or even daily basis. You’ll also have the ability to specify the criteria of the reports to meet your specific requirements. These reports can prove invaluable for anticipating, as well as resolving, security issues. As such, they are ideal for helping you adhere to GDPR data protection requirements. It’s important to be able to search for particular types of activities that indicate possible security breaches. When it comes to breach detection, certain user actions and changes will be more indicative of suspicious behaviors than others. Although reports can give you a picture of what’s happening on your site, it helps to have a more immediate means of searching for specific kinds of problematic activity. With WP Security Audit Log, the processing of identifying breaches and finding out when they happened is sped up considerably. This is thanks to the search feature, which lets you type in any term associated with a potential breach, and get a comprehensive readout of related actions. 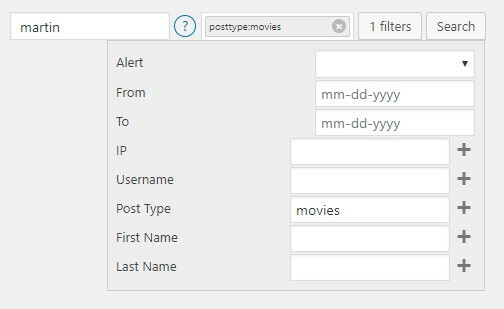 You can also filter these security alerts, and view the IP addresses associated with them. So far, we’ve been talking about how to use your security log to ensure to help you move towards GDPR-compliance. However, it’s equally important to ensure that the log itself is protected and compliant. If unauthorized people gain access to your log, even if they are well-intentioned, that constitutes a breach of personal data. What follows are three ways you can optimize the security of your WordPress activity log, and ensure that only authorized personnel can access it. Keeping your log secure will mean restricting access only to personnel who have the necessary role and associated permissions. This will enable you to establish accountability when it comes to protecting user data for GDPR compliance. WP Security Audit Log makes the process of restricting access to the log streamlined and intuitive. All you need to do is navigate to Audit Log > Settings. Once you check the Restrict Plugin Access box, you can proceed to add the roles (or specific users) who will be able to access the log. It is highly recommended that only admins, or staff with relevant data processing authorization in your agency, be given permission to view your log. Of course, it’s equally important to ensure that admins are only collecting and monitoring the user data they are entitled to. With WP Security Audit Log, you can exclude the monitoring of custom fields and IP addresses, to better maintain privacy. You can also manually select what changes the plugin should keep a record of. Since the GDPR states that data can only be kept and used to fulfill a particular purpose, that data will need to be deleted once its purpose is fulfilled. WP Security Audit Log enables you to customize your audit log retention as required and automatically deletes information after a set amount of time. This handy feature also presents a way of ensuring that users’ right to be forgotten is upheld automatically. It is crucial to store your log in an external database. This is to ensure that, in the event that your WordPress site is compromised, hackers will not be able to access or tamper with your activity log. Securing your log externally will also help ensure that users can safely port it, in line with GDPR guidelines. The premium version of WP Security Audit Log enables you to move your log to an external database in just a few clicks. In addition to heightening security, this process can also improve loading times on your site. You are also given the option to export your log to external central logging systems, including Papertrail, or to your server’s syslog file. Ensuring that your WordPress site’s security and activity log adheres to GDPR requirements may seem intimidating at first. However, as we have seen, there are a few simple methods you can use to make the process much easier. A quality security log plugin like WP Security Audit Log, for example, lets you see and track everything that is occurring on your website. This helps you significantly reduce the risk of a breach occurring in the first place. In the unlikely event that a breach still does occur, your WordPress security log will give you the information you need to determine whether or not you need to notify users – well within the mandatory 72-hour time limit. Following optimal logging and user notification practices. Storing your log in an external database. Do you have any questions about ensuring that your security log is GDPR compliant? Let us know in the comments section below!